Leap Ventures Managing Partner Noor Sweid. "If you’re looking to succeed, keep your eyes and heart open to opportunities. You’ll miss opportunities that come to you if you’re not open to them. Success is about seizing the opportunities that present themselves to you.” This is what Noor Sweid told the audience during her keynote address at the Entrepreneur Middle East Achieving Women’s Forum in May last year, and one look at her impressive career graph so far makes it clear that this is, indeed, a woman who has (and continues to) put into practice what she preaches. Sweid definitely seems to have an uncanny eye for great opportunities- her work profile reads like that if someone who has, really, done it all. She’s worked for big-name corporates (these include Charles Schwab and Accenture), she has facilitated her family business’ (the Dubai-headquartered global interior contracting company, Depa) multi-million dollar growth and eventual US$1 billion IPO, she’s launched and run her own business (the ZenYoga chain of yoga studios in Dubai that she founded in 2006 and ran until its sale in 2014), she’s been an investor in and mentor for several startups in the Middle East ecosystem (besides her own portfolio of past investments, Sweid is also a member of the Board of Directors at Endeavor UAE), and she’s currently a Managing Partner at Leap Ventures, a MENA-based growth stage venture capital firm. So yes –if that last sentence’s length didn’t make it clear already- Noor Sweid does seem to have done it all. But for all of her wins in the realm of business, Sweid had no airs and graces about her when I met her for this interview, during which she freewheeled on everything from her work ethic to the region’s ecosystem. In terms of what she’s up to these days, Sweid’s focus is currently on Leap, which launched a $71 million fund for Lebanon last year, and is now in the process of putting together an $80 million regional fund. “As with any venture capital firm, we do several things simultaneously,” Sweid says. “So we look at the pipeline, we invest in companies, and we raise our own funds. Last year, we looked at about 200 deals, and we are hoping that this year, we’ll look at even more. As the pipeline grows in the region, and more people start companies, and more of the companies grow, more will filter into our pipeline. So, we are very active in terms of looking at deals, and then assessing them and seeing how many really fit into our verticals and our mandate.” It must be noted here that Leap is solely focused on growth stage companies- not startups. So, of the 200 or so enterprises Leap’s team reviewed, Sweid reveals that only 17% of them even qualified as being in growth stage. But while the pool of qualified applicants may be a small one, the need for a firm like Leap in the Middle East cannot be understated. 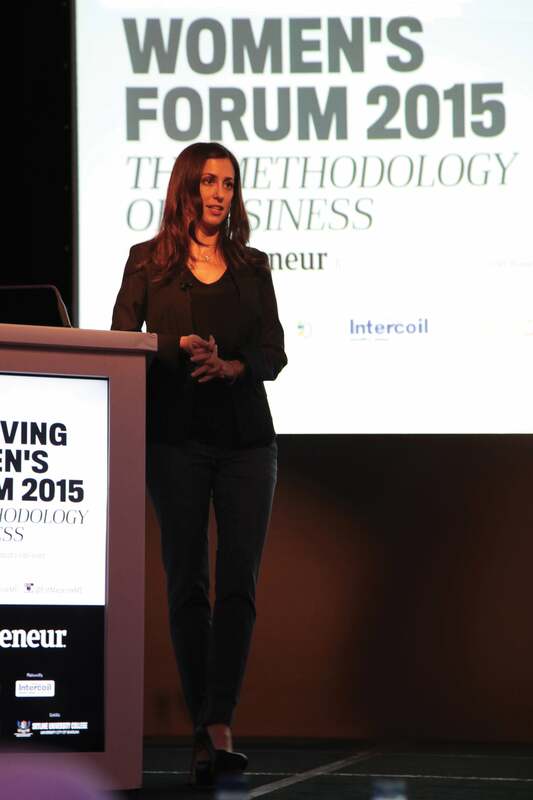 Noor Sweid at the 2015 Achieving Women's Forum. Image credit: Entrepreneur Middle East. At this point, I ask Sweid to tell me the names of startups or entrepreneurs in the region that have actually impressed her, or are worthy enough to be considered as role models. She takes a moment to think, before replying with a laugh, “I’m not going you to tell about them!” Jokes aside though, she’s still reluctant to name anyone in particular (she does mention UTURN here, but I feel that’s a safe answer just to placate me, than anything else), and her reasoning for that again is so that entrepreneurs will avoid misconstruing fame as success. “I find that when people become role models, then fame and success get confused,” she explains. “And I think that the ecosystem is not yet at the stage where we can afford that. We need our successful entrepreneurs to be focused on growing their businesses and being successful entrepreneurs, not on being role models and on a speaking circuit. Because our businesses [here] are not that strong yet- they aren’t enough success stories here that we can afford that.” It may not be the answer I was wanting to hear- but Sweid does have a point. The region’s ecosystem is growing, yes- but we need it to grow much bigger before we can champion it to the world at large. And with people like Sweid along for the ride, one hopes that it will happen sooner than later.